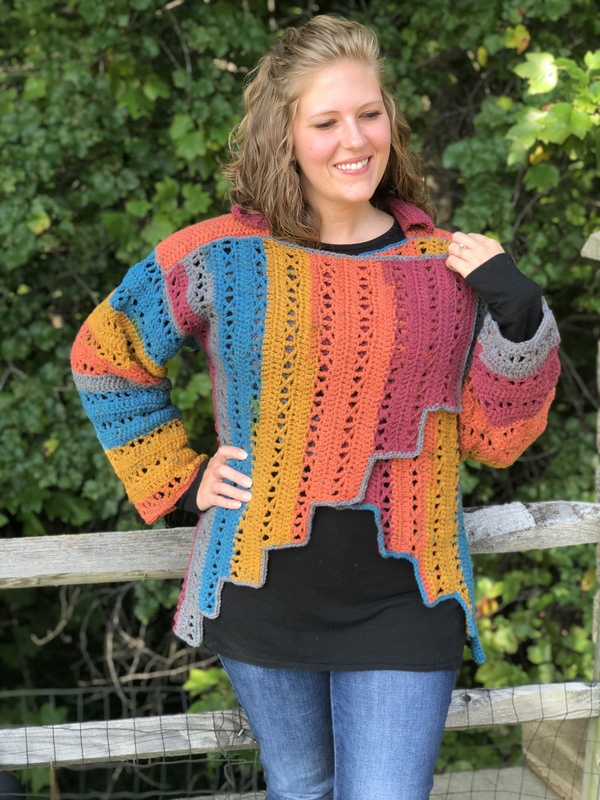 The X-capade Cardigan crochet pattern is an intermediate level pattern. 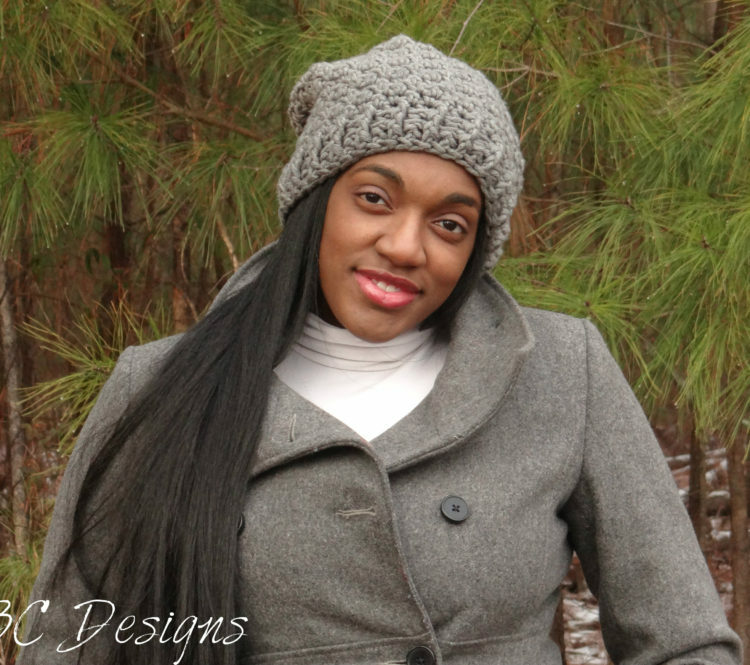 This project uses worsted weight yarn and a size I/9 hook. 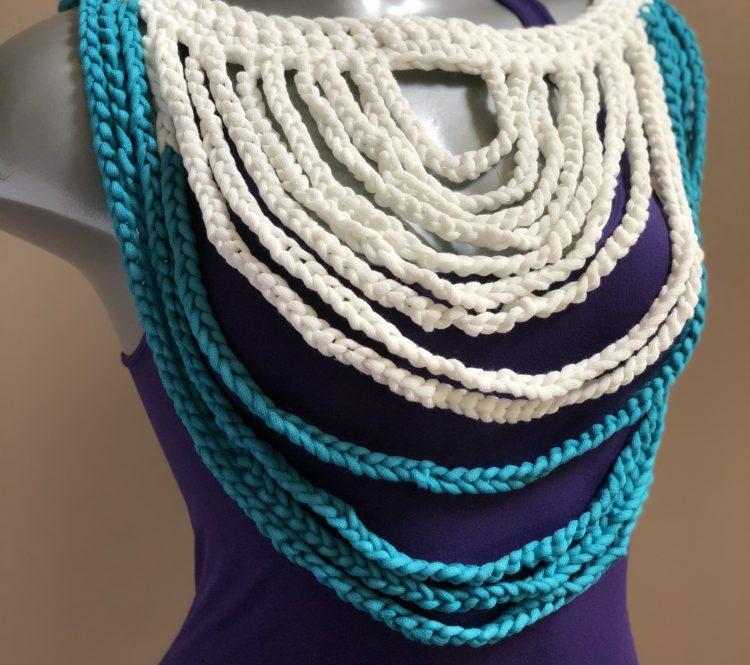 The unique hemline, the X-stitch and manner of construction will be a fun challenge for an advanced beginner looking to increase their skill, and keep the interest of the most experienced crocheter. Be prepared to receive lots of compliments when wearing this cardigan all year round. 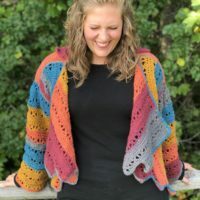 The X-capade Cardigan crochet pattern offers a unique geometric hemline across the front and back. This patter is graded from a XS/S through 5X! So no matter what size you decide to make for yourself or as a gift, you’ll display your unique style. This cardigan is designed with wide kimono-like sleeves, and an option to make more fitted, tapered sleeves. 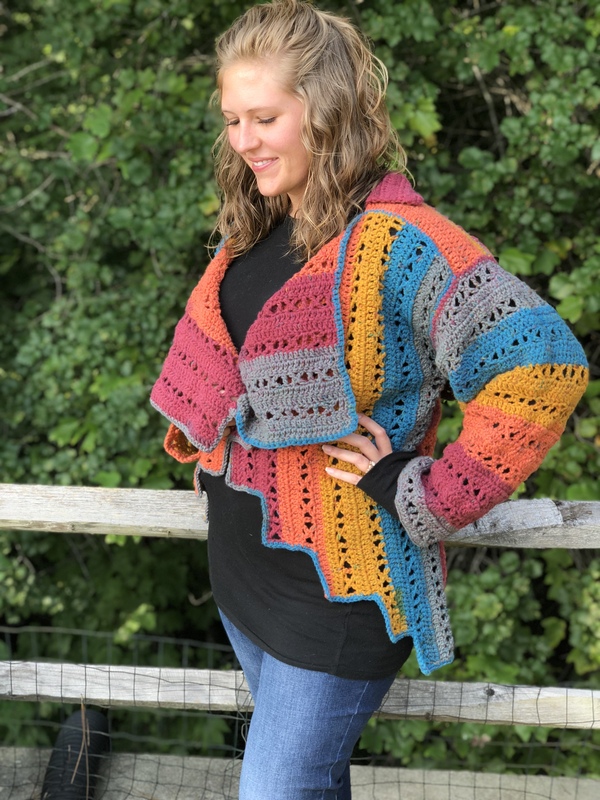 With the overlaying style of the front of the cardigan, you can add a button or two near the shoulders to attach the front, or use your favorite small shawl pin as a closure. If you prefer an open front, you can pin the fronts where the begin to cross, or even wear a belt to create the draped look. 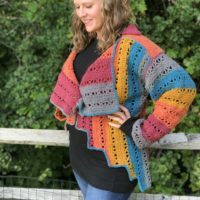 The sample cardigan was made with Caron Big Cakes yarn in Toffee Brickle to create the beautiful striping effect. You do not have to use the same yarn or color way. 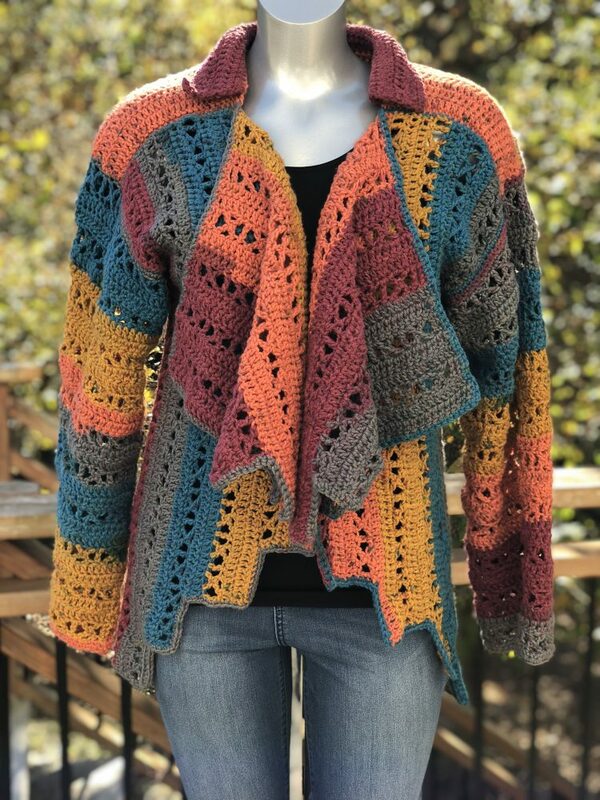 This cardigan will look beautiful in a solid color, and would be stunning in just two colors, as well. Go stash diving for complementing shades of yarn scraps. You know you have a ton waiting to be used. 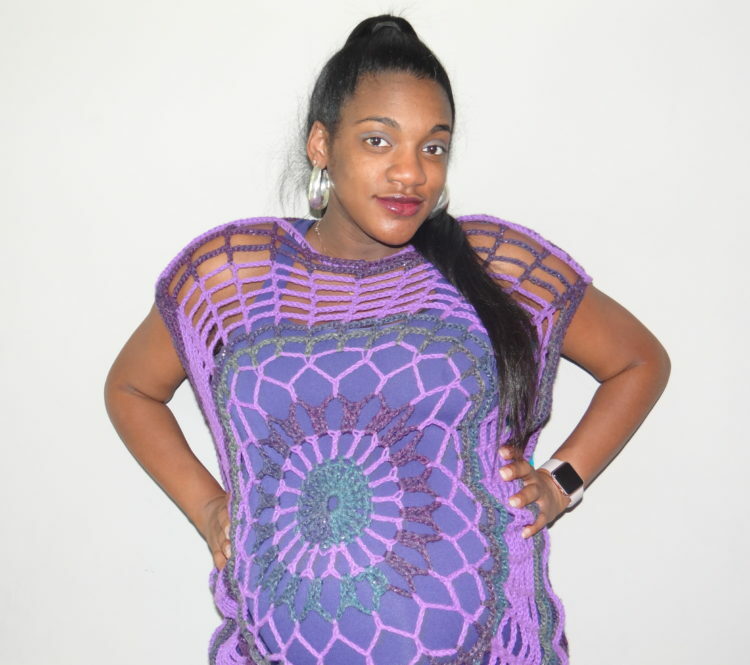 *This product is for the crochet pattern, and not a completed garment. 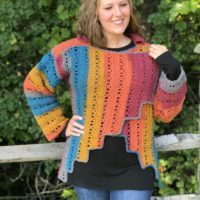 You may sell completed items from this pattern as long as proper credit is given to Courtney Whitehead of Creations By Courtney. Be sure to check your gauge before starting the project to ensure fit and that you have enough yarn. X-St: each X-St is followed by a treble as follows – YO 2 times, insert hook in next stitch, YO, pull up a loop (4 loops on hook), YO, pull through 2 loops (3 loops on hook), YO (4 loops on hook), skip next 2 stitches, insert hook in next stitch, YO, pull up a loop (5 loops on hook), [YO, pull through 2 loops] four times, chain 2, YO, insert hook from right to left under two loops in center of the X (not under the legs of the X), YO, pull up a loop, [YO, pull through 2 loops] twice. Complete a standard treble crochet in the next st [YO 2 times, insert hook in next stitch, YO, pull up a loop, (YO and pull through 2 loops) three times]. 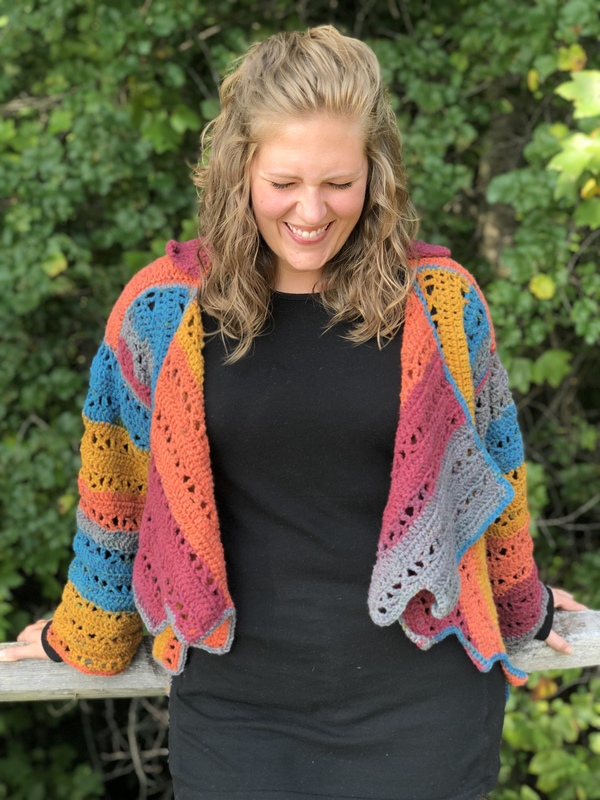 Don’t forget to share progress pics and completed cardigans on social media (I really enjoy hanging out on Instagram) by using #cbcdesigns and #CreationsbyCourtney.